As a board-certified pediatrician, I am embarrassed by the article, “FAAP helps change California vaccine law,” published on June 30th, 2015. California State Senator Richard J. Pan, M.D., a fellow of the American Academy of Pediatrics (FAAP), sponsored the bill, SB 277, that Governor Jerry Brown has just signed into law. This law removes the informed consent process and takes the right to make medical, philosophical, and religious decisions away way from parents. If you decide in tandem with your doctor to forgo just one vaccine on the state-mandated schedule, your child will no longer be able to attend public or private school in California, and will also be barred from daycare. Physicians in California will now no longer be allowed to fairly and honestly explain the pros and cons of various vaccines to families. With the state legislature making medical decisions for families by threatening to exclude children from school, the physician-patient relationship becomes irrelevant. “I hope that it causes parents to receive information about vaccines, to have conversations with their pediatrician and other health care professionals and rethink why they had concerns about vaccines, (and) that they will become more open to listening to the actual science and facts and turn away from the misinformation that’s been peddled by too many people,” Senator Pan told the AAP. The truth is that it is Senator Pan, Governor Brown, and many of my mainstream medical peers who need to “turn away from the misinformation that’s been peddled” to the doctors by the Centers for Disease Control, the AAP, and the pharmaceutical companies that profit enormously by this new program of forced vaccines. first, since parents are forced against their will and better judgment to vaccinate, because that pharmwhore Pan (got paid $95,000) and now the child cannot attend school or kindergarten, then parents need to refuse to pay school taxes. Furthermore, doctors need to sign a statement that they are totally in the dark what is in the vaccines, and if the child is vaccine injured the doctor can be sued for attempted homocide. Politicians practicing medicine without a license at the behest of pharmaceutical companies who are being enriched by mandatory public compliance. This is more than a police state, it is a tyrannical madhouse with no concern for public welfare. God have mercy upon us! Thank you, Dr Paul. You are a man of honor, of integrity, of heart. I applaud your courage. 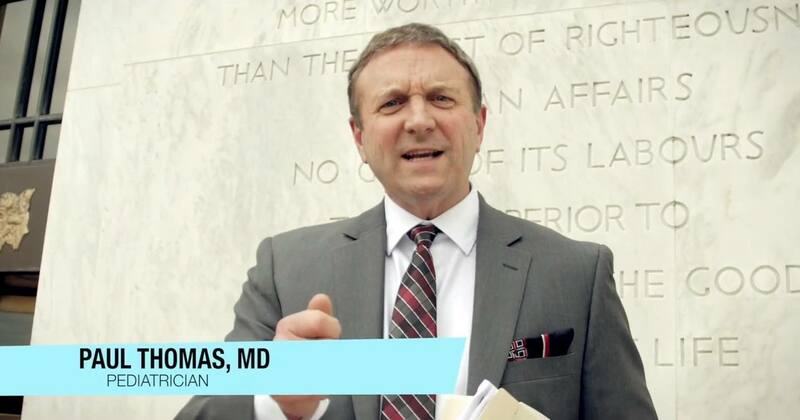 Excellent, Dr. Thomas. Many governors, legislators, doctors, and pharmaceutical companies love power and money and influence and will toss out informed consent and parental rights at the drop of a hat, just as have all tyrants and fascists throughout history. Your article is calm, reasoned, and sound. --- Just another "crazy" man with a science background and Ph.D. This is so sad! When actual health of children, especially newborns, not even on the minds of vaccine industry! Profit, profit, profit by any means! Big Pharma is a big always hungry monster that kills and injures thousand innocent children totally disregarding their future! And how come that people we voted for all together become blind and deaf to all facts and voices of reason? It is very scary world we live in now! Well written, Dr. Paul. Thanks for speaking up. SB277 strips our religious rights, right to a free public education and right to make our own medical decisions. Some of those who voted for this bill are pro choice, but seem to believe "Your body, your choice" should be applied selectively and conveniently to fit their wishes. Isn't this against the Geneva code? Every person has a right to refuse medical intervention? I don't understand how they are getting away with this crime against human rights.